June is always hectic – activities to do, sports events to attend and lots of lunches to say goodbye to those going away for the summer or for good. Right before the end of term last week, Catherine invited me along with another friend of hers to lunch. She had given me a choice where I wanted to go: Metis (I had been for dinner once), Sardine (haven’t been yet but heard it’s better for dinner), KuDeTa (I had been several times) and Biku. In the end, she suggested we go to Biku as it would be a perfect place for a casual lunch. After a busy morning at the school for the yearly mini-Olympics, I rushed to Seminyak and got there at noon, just in time for our lunch. Biku is a traditionally a tea room in an antique Joglo (teak wood house from Java). Although tea is their specialty, they are slowly becoming popular with the local crowd of “ladies who lunch” as they have an all-day breakfast menu, an a la carte menu and a traditional afternoon tea menu. 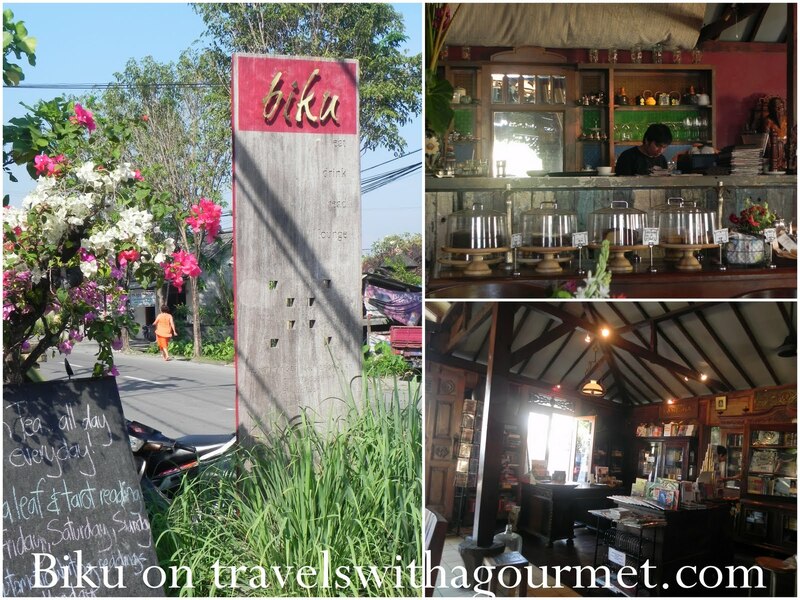 The place is located in Petitenget which is slightly further than Seminyak and in the up and coming Kerobokan area.. Aside from the restaurant, there is also the local branch of Ubud’s Ganesha bookstore right by the entrance. 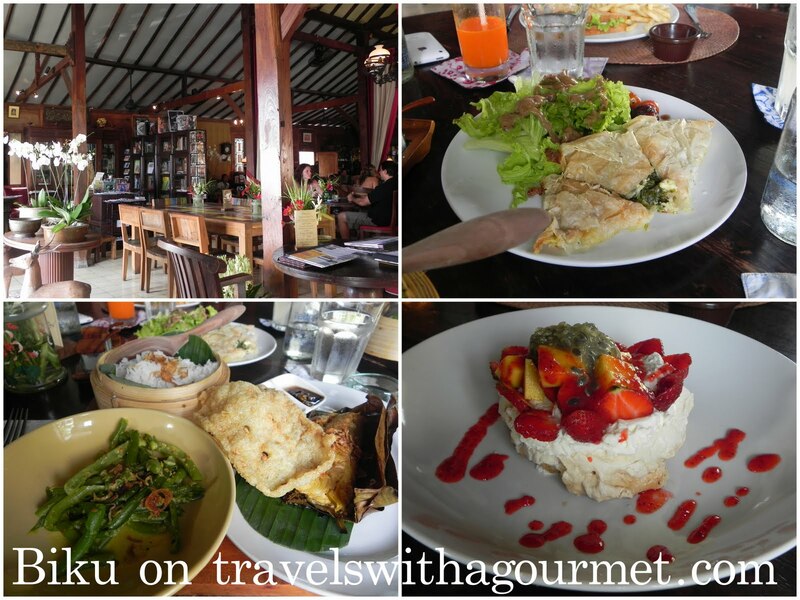 After looking through the menu, we decided to share the spanakopita (Feta cheese and spinach in filo pastry triangles) then Catherine had a club sandwich and Genevieve and I had the traditional dish of Pepes Ikan Laut (grilled snapper wrapped in banana leaf and served with rice and vegetables). The portions at Biku are large and the food quite good. After we polished off the main courses, we shared the fruit pavlova – loads of strawberries and passion fruit, whipped cream and meringue. Lunch went by quickly and right after, I had to rush off back to the school for pick-up so we said our goodbyes for the summer and promised to meet up again at the end of the school holidays in August. 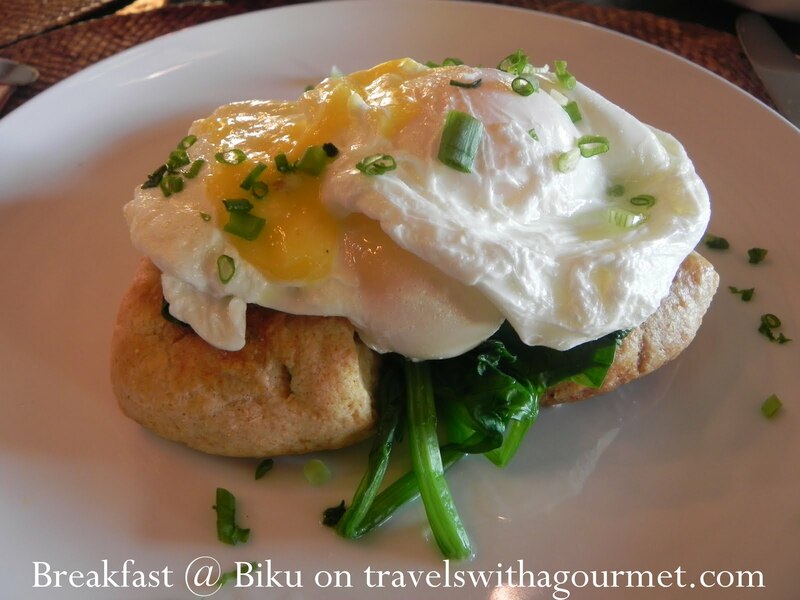 I enjoyed Biku so much that on my husband’s day-off, we went there for breakfast and had another delicious experience. Their all-day breakfast menu is a treat. I had the soft poached eggs with cheddar and chive buttermilk scones and Hollandaise. It was a modern take on the traditional eggs Benedict and perfect for brunch. Now the only thing I haven’t tried is their afternoon tea which I heard includes the traditional cucumber sandwiches, scones and their own selection of teas. And next time I’m going to make time and drop by Namu, the chic little boutique right across the street which has a very interesting mix of clothes, shoes, accessories, ceramics and art. Thanks for checking in! I think Biku is such a cozy place for breakfast or luck with the ladies. If you haven’t been for tea, you should. It’s also worth it.